Rango is a successful animation film with top visual effects that unfortunately fell short of expectations at the box offices. The reason for that can probably be found in the topic which does not necessarily appeal to children but rather to movie-experienced adults who recognize the various references to movies from the Western genre. Thus, the movie can be recommended to those people. When watching the supplements of the extended version, one gets the impression that some of them have been removed because they may have been too daring for children’s eyes. Some of the jokes, e.g. on the banker’s corpse, are really a bit rough for a film which is aimed at children; and perhaps they did not want to teach the children that spitting can be cool sometimes either. It is rather unlikely that the cut was necessary for the PG. Maybe Paramount took care of that on its own. After all, many parents wait for the opinion of relatives before they take their kids to the cinema, and one or two rough jokes might restrain them from doing so. Overall, the Extended version is 4:42 minutes longer. Rango tells the armadillo that he desperately needs water. Moreover, he only has one layer of skin left. Certainly, one can see the interior life soon as one does already with the armadillo (Rango looks at the flat middle part). He is just not made for the desert. Mayor: "Control the water and you control everything. But I don't have to tell you that. Being a true man of the West." Rango: "West is the .... Best"
As Rango has left the office, one can see the mayor and William. William asks the mayor whether Rango is a problem. The mayor gives him the response that he is not a problem, but the answer. The dance around the water lasts a bit longer. They spit. When the search party is under the benches of the tunnels, the extended version is longer by one dialogue along with an alternative shot. Barkeeper: Whole town's perforated with them." Ratte: "She's got more holes in her than a painted lady on a porcupine." Eidechse: "Hey, my daddy took me to her place. - Not what I expected." Hase: "How'd them fellers find the bank, anyway?" The search party walks through the tunnels a while longer. Einer: "Sure is humid down here." Kater: "Yeah, it's activating my piles." Kröte: "I had a goiter removed once. Looked lie Tony Bennett stepping out of the shower." Anderer: "Shoot, I put that on a tortilla." Moving on in the tunnel. The cat and the bird with the arrow on its head are arguing. Vogel: "Well, now that there is a pipe. It's got to be connected to something." Kater: "You talk too much. Why don't you put a cork in it?" Vogel: "Why don't you put a cork... Tell you where the sun don't shine." Kater: "Your mama did. I'll cook her right up." The toad barges in between. The theatrical version contains three additional frames at the end of the previous scene. 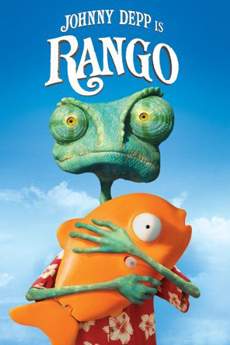 Rango: "Dearly beloved. We are gathered here today to honor this man. Mr. Merrimack, you have the right to remain silent. Speak now or forever hold your peace. Amen!" Kinofassung: "... The people of the village will always remember - the name of the one who saved them: RANGO." Extended Cut: "... The people of the village will honor his memory - even as they abandon their dignity." The extended version has got a completely new closing scene. Due to the loads of water, the city Dirt was renamed Mud. Furthermore, there is a beautiful beach which the city’s inhabitants can relax at. In the meantime, Rango sets off for chasing criminals somewhere else. Beans made a sack lunch for him and gives him good advice for his journey, which Rango considers embarrassing, for after all he has an image to maintain. After he has screamed in panic for his Tic Tacs, he rides off toward the sunset.